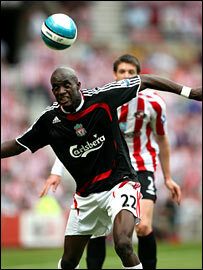 Mohamed Sissoko and Andriy Voronin scored their first Premier League goals as Liverpool saw off Sunderland. Sissoko got on the end of a good Liverpool move to fire a low shot past Sunderland keeper Craig Gordon. Fernando Torres and Voronin should have increased the Reds' advantage but Gordon was in inspired form. Apart from a couple of Anthony Stokes efforts, Sunderland rarely threatened and Voronin cut inside late on to fire a right-foot shot past Gordon. Sunderland manager Roy Keane had tipped Liverpool as title contenders before the game - and they showed a steel perhaps missing in recent years in holding off a home side full of commitment but lacking in quality. Liverpool were the better side from the kick-off and Sunderland right-back Greg Halford almost gifted the visitors a lead inside 30 seconds with an under-hit backpass. Voronin won a race with Paul McShane to get to the ball but his effort was saved by the body of Gordon. But other than that, Sunderland managed to frustrate Rafael Benitez's side for much of the half. The Reds enjoyed plenty of possession but it was mainly restricted to their own half as Keane's men harried and pressed their illustrious opponents. Both sides were not helped by the loss of a player inside 20 minutes, with Liverpool's Sami Hyypia forced off with a bloody nose and an injured Kieran Richardson soon following him down the tunnel. Sunderland got a sniff at goal when the otherwise impressive Jermaine Pennant gave the ball away and Black Cats substitute Stokes got on the end of a Michael Chopra pass but could not beat Pepe Reina from a difficult angle. Liverpool got the breakthrough towards the end of the half when a Xabi Alonso cross was headed back across for Voronin, who laid the ball into the path of Sissoko, who fired a low shot past an outstretched Gordon. It ended Sissoko's 75-game wait for a first goal for the Merseysiders and also brought up Liverpool's 7,000 in league football. Torres could have added number 7,001 before the half-time whistle. The Spaniard headed a Pennant corner past the post and was then denied by a brilliant piece of goalkeeping from Gordon after Liverpool burst on to a fluffed clearance from Ross Wallace. Gordon showed why Keane paid £9m for him as he again denied Torres, who had burst between Nyron Nosworthy and McShane the other side of the break. Liverpool's expensively assembled front two of Voronin and Torres began to profit from the increased space afforded as Sunderland started to chase an equaliser. Sunderland became more adventurous in the final half-an-hour but, aside from a long-range effort from Stokes that had Reina scrambling, they failed to seriously threaten snatching a point. And in the closing minutes Voronin found space in the box to finally find a way past Gordon with a clinical finish to make sure there would be no late drama for Sunderland this time. Subs Not Used: Itandje, Mascherano.Booked: Arbeloa.